The latest new old name to come to the Archive’s attention is that of George Grey Nash. Thanks to his grandson Justin Nash, we now have a snapshot of this Flint, Michigan tattooist. Nash’s tattooing history is hazy, but family members have stated that he worked as a tattooist with the circus and carnivals. An uncle remembers that Nash had an old black trunk that had Tattooer and G.G. Nash painted on each side in gold lettering. Family members also told the Archive that George did not talk much his tattoo years. 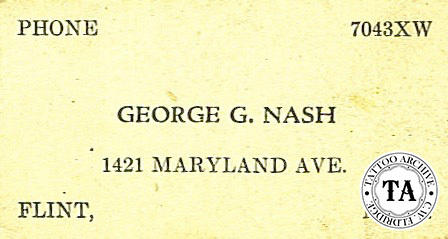 George Nash's business card shows him at 1421 Maryland Avenue in Flint, Michigan. It is unknown if this was his tattoo shop or if George worked out of his house when he was not on the road. This Maryland Avenue location was just across the street from the General Motors headquarters. 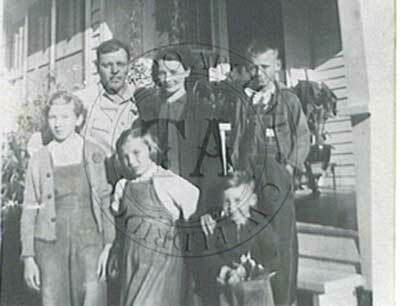 We do know that around 1938 he and his family moved to Kansas City where he worked for General Motors. The Collection includes four classic Charlie Wagner machines with a train style transformer, which was run through a four-machine switchboard with a large white ceramics rheostat. The switchboard and machines was set up for connector cords. Several sheets of flash were found; some were large vertical sheets that were rolled and could have been used in a sideshow display. 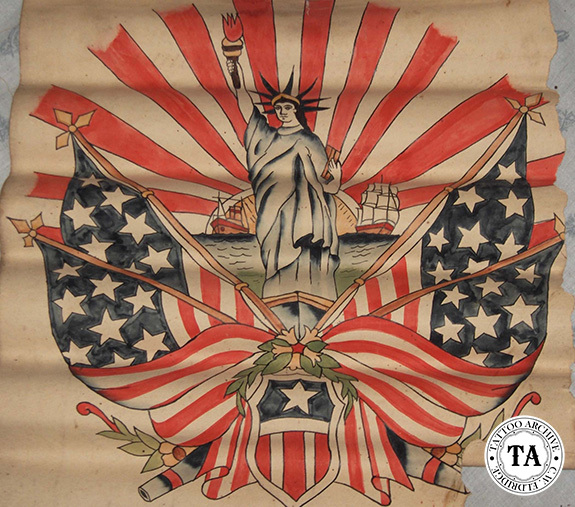 Many of the designs were from World War I and included the rose of no-man's land, flat-hat sailor designs and clasped hands. The lettering sheet offered circus style fonts at 25 cents a letter in two colors, black and red. There were also a few tubes, tips, cloth covered cords, pigment bottles, an interesting angled steel foot switch and other odds and ends. The condition of the metal items was not good, as they were first stored in a shed and then moved to a basement. 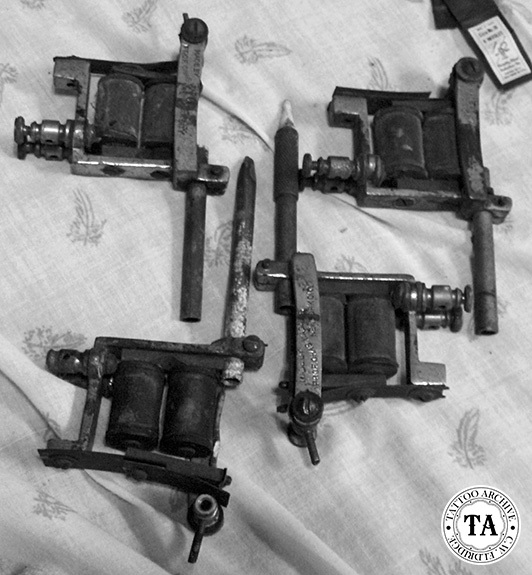 However, with all that said, some of the machines still run and Justin, an aspiring tattooist, had tattooed himself with one.